The social event will start with a tram tour, which will cruise along touristic attractions of Zurich for 30 minutes, and will be followed by an Apero and a dinner in the Belvoir Park restaurant. Make sure you take along the social event voucher, which is included in the registration package. Additional social event vouchers for spouses or friends are available for purchase in the registration desk. We will meet in front of the ETH main building (marked on the map) at 18:50 and will board the PAM tram at 19:00 precisely. As the tram cannot wait on the tram stop, please make sure you are there on time. The tram will drop us off at the Brunaustrasse tram stop and from there we will follow a 10-minute walk to the Belvoir Park restaurant. This villa was home of famous Alfred Escher, who initiated the construction of the first Gotthard Base Tunnel. He was also one of the main founders of Credit Suisse, Swiss Life, and the Polytechnikum (ETH). 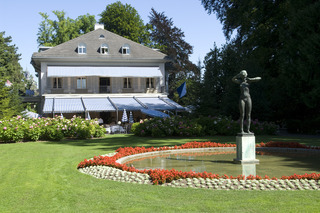 The villa is now one of the best colleges for hotel management in Switzerland and is also a restaurant where students train their know-how. 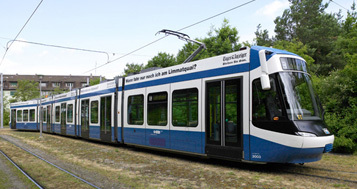 It is located on Seestrasse 125 close to the Brunaustrasse tram stop. While we will travel to the Belvoir Park as a group, on the way back you will return individually or with ad-hoc groups using public transportation. Take tram number 7 from Brunaustrasse stop (marked on the map) direction Zurich, Bahnhof Stettbach. There is a tram every 10 minutes until 22:30 and every 15 minutes afterwards. Tram 7 goes through stops, like Central and Haldenegg, close to the conference venue and the nearby hotels. The tram stops you will probably need to get off are annotated on the map. The tram journey should last 12 to 14 minutes. Before getting in the tram, validate the ticket included in the registration package. 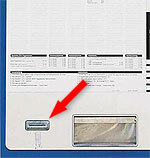 A validation machine looks as in the picture bellow. A ticket is valid for 24 hours after validation for the center of Zurich (Zone 10). You can check the locations related to the social event in the map bellow.